Daniel Toben, 30, cleans up trash behind a gas station in Carrboro (Emma Peaslee/Carolina Connection). A local man picks up garbage – not as a job, but for fun. 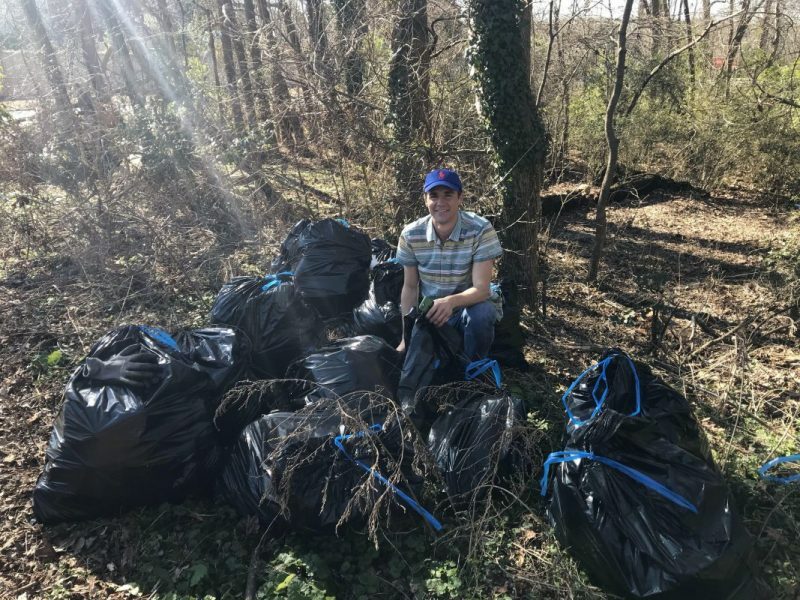 Daniel Toben grew up in Carrboro, but it wasn’t until his time at North Carolina State University that he began to develop a passion for picking up trash. Almost 10 years later Toben has raised more than six thousand dollars to support his hobby. Emma Peaslee has the story. Here’s hoping Daniel Toben’s idea of fun becomes an epidemic! So grateful for his example and for the reporter who brought his story to light. Clearly a life well-lived and a story well told! What a lovely story about a man with a larger vision for his community and world. Emma Peaslee’s thoughtful interview brought home this message beautifully. Daniel, so proud of the caring man you have become. We hope your passions always lead to so much good as this one has. You are an example to others.